The Delaware Botanical Gardens held a ‘Sip & Saunter’ event on Friday, May 4. Right, DBG designer Piet Oudolf goes over the garden’s plans during the event. On May 3-4, internationally renowned Dutch garden designer Piet Oudolf landed near Dagsboro, at the new Delaware Botanic Gardens (DBG). He was in Delaware to supervise the gardens’ 100 volunteers planting nearly 18,000 new native perennials in the 2-acre Meadow Garden. The planting took two days and added to the 17,000 native perennials planted last September. To mark the occasion, a Sip & Saunter celebration for garden supporters and volunteers was held on Friday, May 4. The celebration was the first public onsite event. Attending the celebration were state and local officials, including U.S. Sen. Tom Carper and state Rep. Ron Gray. Standing in the center of the meadow, Gray presented Oudolf with a tribute proclamation from the Delaware House of Representatives. The tribute said, “Be it hereby known to all that the House of Representatives acknowledges Piet Oudolf, designer of the Meadows at the Delaware Botanic Gardens … for creating a magnificent two-acre Meadow at the Delaware Botanic Gardens. Because of his commitment to the importance of native species for the overall health of Delawareans, this design consists of more than 65,000 herbaceous flowering plants and grasses, that include 85 percent of native species and the remaining 15 percent are pollinator compatible exotics. The mission of the Gardens is to create an inspirational, educational, and sustainable public garden in Delaware for the benefit and enjoyment of all. 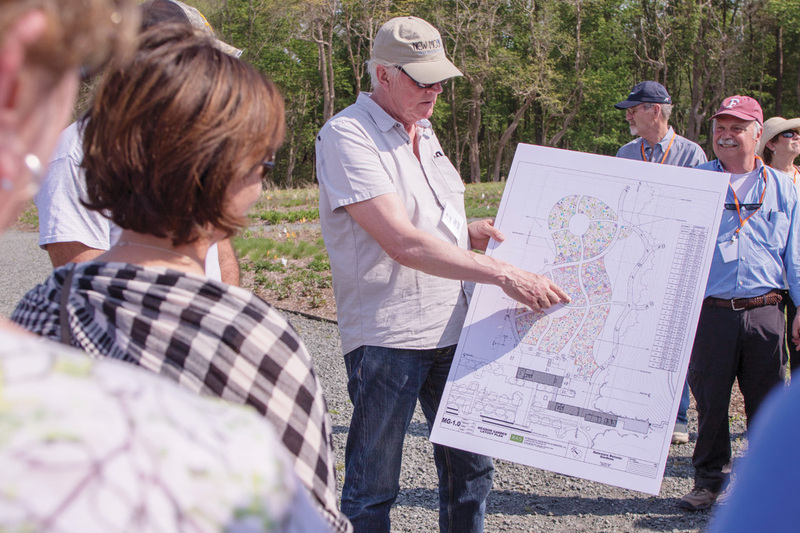 The Delaware Botanic Gardens will celebrate the coastal plain with a sustainable garden designed to delight and educate visitors and inspire them to preserve Delmarva’s native landscape. For further information on the Delaware Botanic Gardens, go to www.delawaregardens.org.